[WIR] X-Men: The Strangest Super-Heroes of All! Good god, I did not realize how, well, decent the intended storyline was going to be. Previous to this thread starting, I was of the opinion that 'Scott wasn't a jerk, the writers just kept making him be one' -- which of course is pretty silly, since the writers get to make the character-- however, it felt like the writers kept making tonally nonsensical decisions with Scott for the sake of drama. Well, we've read this thread and I came to realize that, no, Scott was never really written as all that good, and was taking jerkish actions from the beginning. Now I at least remember why I thought it was the writers -- you give a character this kind of story and then choose not to do it? Yeah, writer's fault. 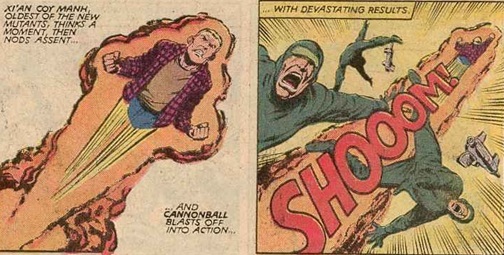 The thing is that isn't Claremont's fault entirely. It was the writers of other books (Kurt Busiek of Astro City fame in fact was the one who came up with the retcon that it was never real Jean that became Dark Phoenix in the first place.) that brought Jean back and the Editorial (i.e. 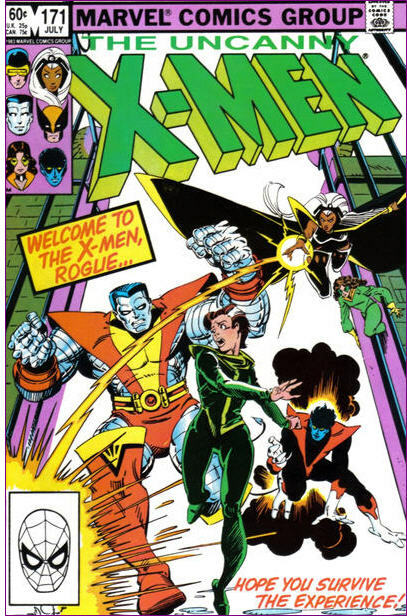 Jim Shooter) that came up with X-Factor as idea. So it's a case of too many cooks working at cross purposes which does tend to happen in a shared universe. Yeah, sorry, I was not clear enough. I'm not looking for a specific individual to blame. More a realization that yes, I was right originally -- Even if Scott kind of was thoughtless and clueless from the get-go, he should have gotten a better (and more positively-light-casting) narrative than the slowly-making-worse-and-worse-decisions that we've had with him off an on for the past 30 or so years. Charles tries walking again, but collapses after only a single step. 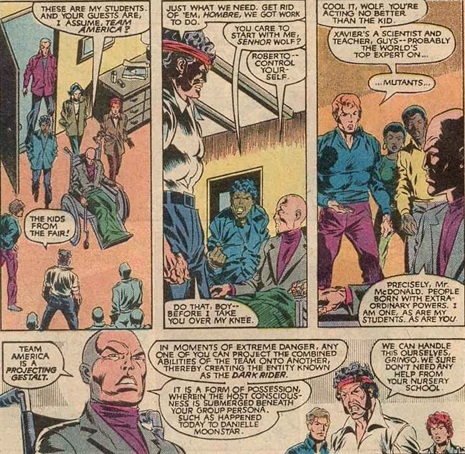 He vents his frustration at the inability of the great telepath to control his own mind and his concern that the stress is keeping him from mentally supervising the New Mutants. 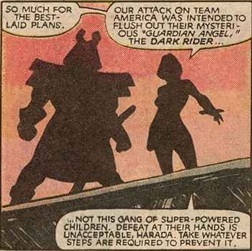 Lilandra reassures him they don't need him to be on call all day every day, which of course means something nasty is about to happen. Does Xi'an think wearing a costume, any costume, makes you unidentifiable? Not that I want them to start wearing the hoods, of course! 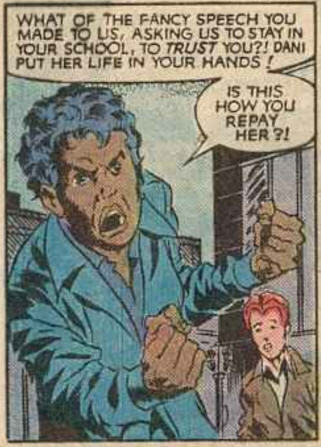 Rahne and Roberto try to help, but Harada's able to teleport away with Dani before they get to him. Dani accidentally conjures images of Sarkissian's past, angering the villain. She promises Dan will pay for that insult "with your life!" 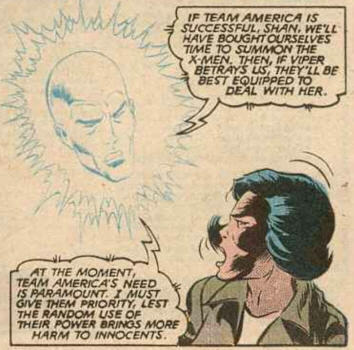 While Xi'an disapproves of Roberto's aggressive posturing, she agrees that they should try to find Dani "with or without Professor Xavier's aid." Charles is aware of their rescue plan and respectful of their courage, hoping that if anyone needs to die, it will be him. 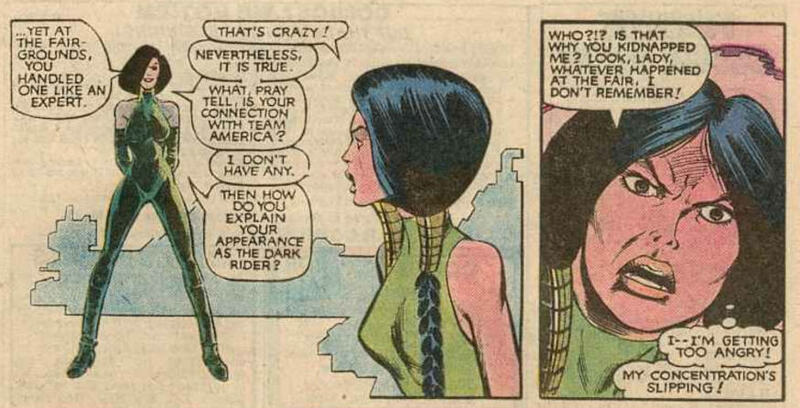 "Madame Hydra, the first woman to achieve that position"
What are you trying to say, Chris? And here we go. At 171, this is where my unbroken run starts for years and years. 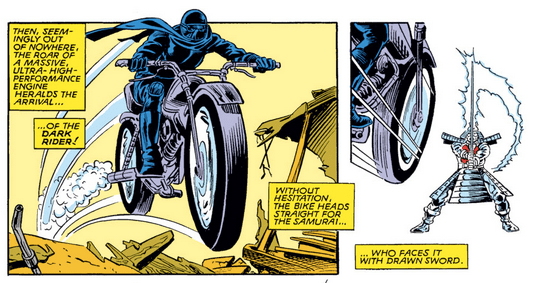 The crossover with the motocross heroes, especially so early in the run, struck me as a very weird choice. 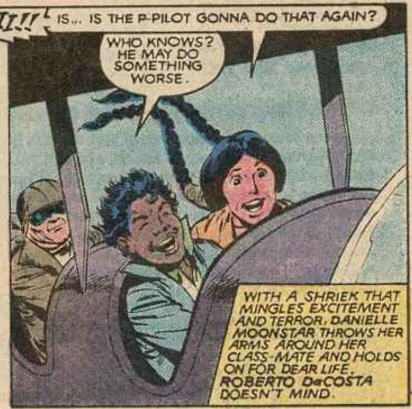 Maybe motocross was super popular back in '83 and this was meant as a bump for the New Mutants? So, Team America. They had their own licensed comics series, based off some toy line. As much as I can discern, it had just gotten cancelled after 12 issues, with the abrupt reveal of the Dark Rider/Marauder (a series-long mystery) while they were fighting HYDRA. 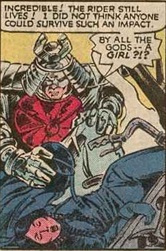 (The last few issues smack a bit of desperation, guest-starring the likes of Iron Man and Ghost Rider.) The cover to the last issue includes a "Because YOU demanded it... the End of Team America !" blurb, which kinda tells you everything. While the first issue was written by Jim Shooter (who also came back to co-write a few more), most of the series was written by Bill Mantlo, of ROM/Micronauts fame. 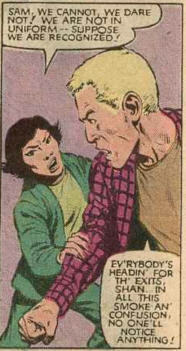 Thus, their guest-starring in a couple of early issues of New Mutants feels all the more incomprehensible. I guess it's an alright excuse to get the kids to fight actual supervillains such as Viper and Silver Samurai (since HYDRA had just been tied to Team America's origins), but it doesn't speak well for the book having any kind of long-term direction or consistent tone.